Do You Want to Eat Like A Dinosaur? This Giveaway Is Your Chance! I think this cute guy inherited his mother’s love of cookbook reading. The other day, waiting for us on our doorstep, was our copy of the new cookbook Eat Like A Dinosaur, by the Paleo Parents, Matt and Stacy. My oldest son, who had been anticipating the book’s arrival, was so excited that he never even took off his jacket or put away his lunchbox. He just tore open the package and plopped his tiny little behind down at the counter and read the entire book cover to cover. After my son skipped over the “Boring Chapter for Parents” (the book calls it this, not me), he read the actual Eat Like A Dinosaur story out loud to his little brother. And then he read it again. After that, he started pouring through recipes. This book has over 100 kid-approved recipes and projects that are free of grains, dairy, and legumes. I think he had our entire menu planned for the next two weeks on that first afternoon. We have had a blast cooking our way through the book…everything that we have made together has been a hit and has received a big two-thumbs-up each time. We have all loved everything that we have made so far. My son still has a number of recipes he wants to try, but I thought I better let you all know now how much we are already enjoying this book! over 100 recipes and projects which are grain-, dairy-, legume- and refined sugar-free, but not lacking in flavor or fun! Eat Like A Dinosaur receives 8 thumbs up in our house…since all four of us love it!! IF YOU WANT TO EAT LIKE A DINOSAUR TOO…TWO OF YOU HAVE A CHANCE TO WIN A COPY RIGHT HERE, RIGHT NOW!! 2. Follow Cook It Allergy Free on Facebook (or tell me if you already do). 3. Follow Paleo Parents on Facebook (or tell me if you already do). Two winners will be chosen at random on Tuesday, April 17th at 7:00 am Pacific Time. Winners will be contacted via email then. Entrants must be 18 years of age or older. I follow Cook It Allergy Free on FB. 2 of my children are gluten intolerant. Gradually we shifted to where the whole family (5 of us) are not eating gluten. Now I am eating Paleo and I need to get my kids on board! I would love to limit the grains in our family’s diet, keep to the moderation theme! Plus I have heard so many great things, how could I NOT want to get my mitts on a copy?! I already subscribe to Paleo Parents! We would love love love this at my gluten free daycare! Oh my goodness this is going to be a huge game changer for gluten free families everywhere! I’ve been gluten and dairy free for 25+ years, but am having trouble with digesting something else recently and want to switch to a Paleo diet. That’s why I would love to have this book! I follow Paleo Parents on FB. I follow Cook It Allergy Free and Paleo Parents on Facebook. I really want a copy of this book because my daughter has an tree-nut allergy and it would be great to be able to share these recipes with her school so that we can ensure their Cooking Club are embracing recipes that she can have as well as the others in her class, who also have allergies. I find that we need to help our community understand the impact of allergies and partner with them for solutions. I would LOVE to get a copy of this book because my husband and I recently completed a Whole30, and have eliminated wheat from our kids’ diets, but we’re struggling to make the changes *fun* for the kids (4, almost 3 and 1) so that it doesn’t seem like we’re depriving them of their favourite foods. Oh my, this book would be perfect for my boyfriend’s nephew. He eats a gluten-free diet and he also likes to read. I would love to win this book for him. I have three beautiful nieces and 1 gorgeous nephew and I want them to be healthy forever, so I need this book! And I liked you on Facebook too! Ive started to eat gluten-free about two months ago to get my RA under control, so I’d love to have this book to be able to cook with my nieces and nephews and educate them on how delicious GF foods can be and also to educate their parents that it is easy to cut out gluten, even for kids! I want this book because my daughter was just diagnosed ADHD and I want to take her paleo, she is already gfcf and I want the transition to be easy and an adventure. I already like Cook it Allergy free and Paleo Parents on Facebood! Our household eats gluten free since we have two kids with celiac disease, and since they are extremely picky I think this book would be fabulous to convince them that nutrition can be fun and taste good! I already subscribed to Cook It Allergy Free on FB! I just started following Paleo Parents of Facebook too! since I am eating paleo I can see how much better I feel and perform. I think kids NEED to have a good diet from the very beginning so this book would help me with making paleo meals for kids! I already follow Cook It Allergy Free and Paleo Parents on Facebook. I would love to have this book because I have a 19 month old son who has multiple food allergies (including wheat and dairy) and it is sometimes a struggle to find recipes out there that are both kid friendly and allergy friendly at the same time! I would love this book! My 3 yr old son loves to cook and loves dinosaurs, and I am GFCF. We don’t yet know if he has any intolerances, but I’m always searching for foods we can all eat together. I already follow you on Facebook and have your app! I’m now following Paleo Parents, too! My family is Paleo including my two kids so anything to get them to enjoy this would be great! following Cook it allergy free! I already follow Paleo Parents! I would love to win this book so I can hopefully find some paleo meals that my kids love! Follow Paleo Parents on FB! I have 4 kids that I cook for (2 who are gluten intolerant and I am Paleo) and would put ELaD to excellent use and absolutely love Stacy and Matt. I follow Cook It Allergy Free already. I already follow you on facebook! We follow a dairy free diet due to food allergies. …and also follow Paleo Parents too! I’ve made the switch to Paleo, but my kids (7 & 4) are having a hard time making the switch – this book would be a HUGE help! I want to win this book to give to my niece and nephews; their mom is thinking about going Paleo but running into major resistance! And I follow Paleo Parents on Facebook. Thanks for the giveaway! I now follow Paleo Parents on FB too. I need to follow a paleo diet bc of a chronic health issue. I want to get my kids on board. my son jas Down Syndrome and is gluten free which has helped with GI issues. I’d love this as my little dinosaur is every day more interested in cooking together! I follow Paleo Parents on FB too! I have read the story of this family. How wonderful that they have written a cookbook that not only addresses healthy eating and food allergies, but is appealing enough to engage a child. I would love to win a copy of Eat Like a Dinosaur because I have four little girls and I know this would totally help them get on board for eating better! I like Paleo Parents on Facebook! I follow you. I follow paleo Parents. I would love to add this book to my kitchen – I am always lookIng for new creative grain free recipes for my kids. Following both now. This book would be a huge help to our family which has recently gone gluten free for my husband’s health, and my 11 year old loves to cook! I just started flowing you on Facebook! Happy find! 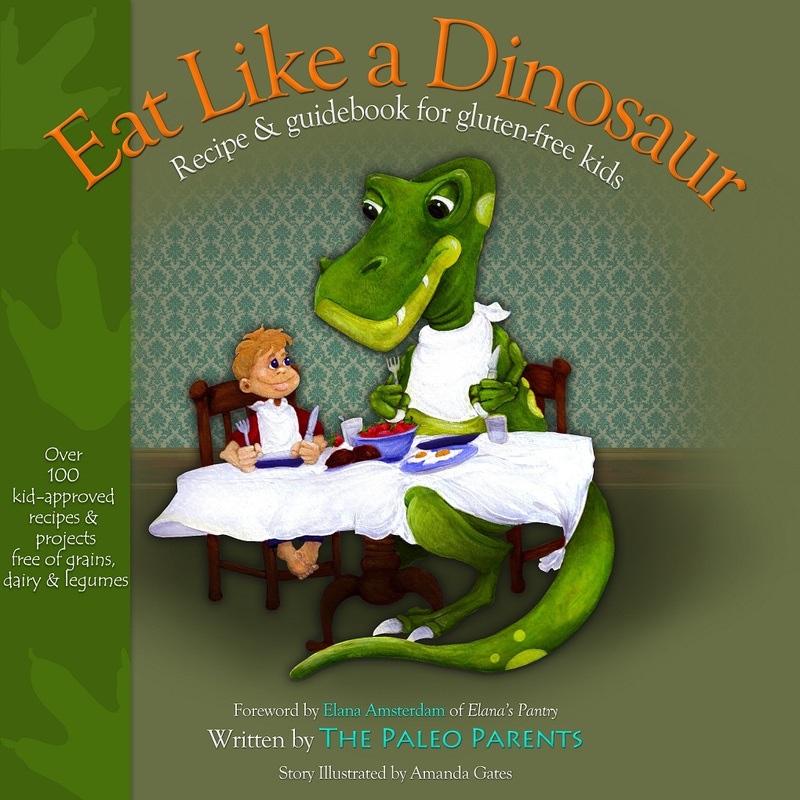 I would love a copy of this book because I need some “kidspiration” for my kids to get them on board for paleo eating . We found Paleo from living my children’s allergies. I would love for my kids to understand the why behind all of this and see that other kids have to eat this way to, and it can be a fun thing! I already follow paleo parents and think they rock! I need more resources for gluten free, dairy free, soy free food! I follow Paleo Parents on FB! This book would be just the ticket to get my little picky eater on the paleo pathway. Following cook it allergy free on fb. I am already following paleo parents on face book. I already follow Paleo Parents and now I follow yall on Facebook. I would love this book because I have read the reviews and heard the talk about the amazing benefits it has. My 3 year olds has a skin issue that doctors have told me she’ll just always have and theres no reason to it. Ive heard that changing to a paleo diet can “solve” or help many issues and if I can help my daughter, Id be so greatful!!! I want this book to give it to my grandson his parents are in disagreement about Paleo lifestyle, Mom (our daughter) for, dad not so for, so I want to get him understanding too! I have followed Paleo Parents for quite sometime now! I have a 4 yr old and after divorcing his dad, I have recently realize all the bad foods I have been ‘poisoning’ him with, but he sees anything green as yucky, I can’t huge vegetables in brownies and smoothies for ever. I’d love this book to get him interested in trying new foods as he is Very interested in what I am doing in the kitchen And reading. I am already a fan of paleo parents on fb. As recent newcomers to Paleo eating and cooking my little 4 year old guy and I would like this book to cook through it together as we discover new health. I already follow Paleo Parents and followed you today. I started following Cook It Allergy Free on FB! I am now following Cook it Allergy Free and Paleo Parents. I would love to have this book because my daughter and I both are on GFCF diet and always looking for new ideas. Thank you. I just had my second endoscopy 2 1/2 years after my initial celiac diagnosis and my intestines are still showing the same amount of damage even though I’m very careful of everything I eat. I still feel tired, achey, foggy and have terrible constant acid reflux. So my next step is to try a paleo/SCD/GAPS style diet and hope for the best. This book would surely help me to do this as I am feeling very overwhelmed and don’t know where to begin! Thanks for the opportunity! I have been doing a gluten/casein/soy/preservative/dye free diet for the last 4 years for my 6 year old with autism and my 3 year old with food allergies. I have recently spent the last few months in the hospital due to pancreatitis. I have been told by my doctor and dietician to eat a low fat, high protein diet to limit the flare ups of the pancreas. I have heard such great things about the book and would love to have a more paleo style diet. With young boys that love dinosaurs, I think they will be excited to help me cook from this cookbook! I’m really interested in the Paloe dite and this book would be such a fun way to learn about it and starting eating that way. I have been looking at this book for a while, I am so intrigued by the paleo diet for our family, I have hashimotos and suffered 3 miscarriages this year I feel cutting grains (and more ) out of my diet may help its just finding things my 3 year old and husband like to that seems like the hard part. this book could help! My daughter (4) and I are are Gluten/ Casein / Dairy / Corn / Egg / Oat Free (+ 20 other foods) due to food allergies… we can use all the resources we can get to make a variety of foods that we both enjoy not to mention the hubby who can eat anything he wants! This book would help me get my kids into eating / cooking more healthy foods that are gluten free. Three of the five of us in our family are gluten intolorent and my youngest is also dairy free. I would like this book b/c the Paleo diet is perfect for all the food sensitivities in my family. what a fabulous giveaway. what a journey we’ve been on the last year. i thought we were on the right track by having gone organic, cooking everything from scratch, eliminating most wheat, refined sugar, etc. ahhh, what my baby son (nearly one year) has taught me. after a traumatic birth he was put on antibioitics and despite probiotics his gut never got off to the right start – he exhibited signs of eczema and allergies early on so i dramatically changed my diet. we’ve since found out it’s very bad candida…. so paleo diet here we come. gluten free has changed things for us so far, and i imagine we will be eating like this for a very long time to come. i’m delighted to find out about this book and thank you for the chance. and i follow PaleoParents too! thank you so much. cooking Paleo may help him. Thank you. Follow you on PaleoParents on Facebook. I started follow Cookitallergyfree on Facebook. My family is all gluten free, and the fact that it is dinosaur themed, and written to kids will really appeal to my kids! I have daughter and granddaughter who need to eat like dinasaurs, and I do it myself most of the time! Would love to win this book for them. I liked Paleo parents on FB. I would LOVE to have this book!! My hubby and I have been eating Paleo for some time. Our kids haven’t had much choice but to eat what’s put in front of them (oldest is 7) but I would love to get them actually excited and involved in our food and meal choices! My 3 year old has recently taken to “helping” me in the kitchen, she would love this! And maybe my 7 year old would be a little happier about how we eat if he had some ownership in it. I already “like” Paleo Parents! Would love to win!! I now “like” Cook It Allergy Free. Fingers crossed!! I already follow Paleo Parents on FB! I already follow Paleo Parents on Facebook. I follow you now on Facebook. I would love this book because I could get my sons excited about eating healthier. We already do the non-processed approach and make much of our own food, but they would really benefit from this book’s approach to children and food. So great! I don’t have any kids yet, but I am doing a lot of research about the paleo diet. If I won this book I would give it to a friend who is just starting the paleo diet. Her child would benefit greatly from such a book! I follow Paleo Parents on Facebook. I am gluten free and would love to reduce or eliminate dairy and gluten from kids diets as well. Hello there! I am a gluten free gal who loves to cook, and would love to eat like a dinosaur– who says paleo gluten free casein free living can’t me delicious? I am the prime paleo for this contest. Plus I love your blog. Thanks!!!!! My daughter needs to eat grain free. I am always looking for recipes that are good tasting and that she can enjoy. I already like Paleo Parents on facebook and I just liked you on facebook now. I want this book to share it with my kids. I think they will really like the dinosaur theme and understand the lifestyle changes better. I’d love to win so I can make those waffles that I keep hearing about! I so want to try this book. My son has been loving trying so many different recipes and this looks perfect for him!! I would love to have this book. My 3 year old daughter and I are already dairy free and recently became gluten free (among other things) a few months ago after an allergy diagnosis. It’s so hard to find good things that she wants to eat. My daughter and I both have celiac disease and have been following a gluten free diet very strictly, but even so we sometimes have problems even knowing we are following it strictly. We want to start a Paleo way of eating to see if we can have better results and start feeling much better! Thank you for this opportunity!!!!! I would love to win a copy of this book to use on baking day with my preschool classes. 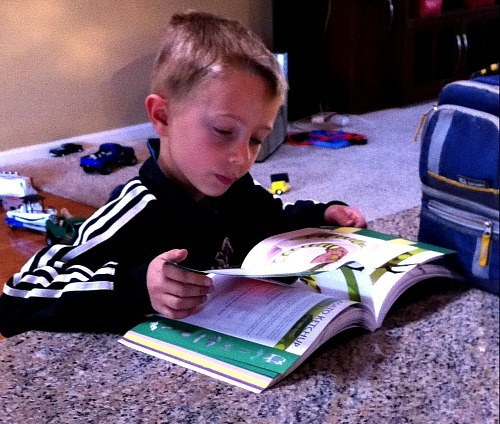 My youngest son Max reads cookbooks too. He normally reads through them and then tells me what looks good and what he wants to try out. I love cooking with my boys! The book sounds like an incredible tool to get the kids in the kitchen to learn more about food! I am now following the Paleo Parents on fb. Now following Cook It Allergy Free on FB! Already following Paleo Parents on FB! Would love a copy of the cookbook! I think it would be just the ticket for some new creative recipes for my picky little eater! Thanks! We recently stopped eating paleo because I thought it was too hard for the kids but I think after this book I will try again! I hope I win this!!! I want this book because of all the amazing recipes, as well as the opportunity to teach my (future) kids why we eat so well! I would love this book because I’m gluten free, but also need to be grain free. I would love to win this book for all the tasty recipes! Liked cook it allergy free on Facebook. Following Paleo Parents now too! I’m sick and sick of not eating food that does/doesn’t make me sick, sounds like it’ll help. Our oldest son Jacob has been GFCF among others because of the allergies and gut issues that unfortunately go along with autism so it would be wonderful to have this cookbook. Have heard so many great things about it! Over the past few years we have really “opened our eyes” to what eating healthy really is about and would love to add these great recipes to our diet. Both of our boys are taking an interest in cooking with us in the kitchen as a family. They would love it! Would love some kid-friendly gf/cf recipes and this book sounds like a lot of fun to use with the kids! I have three children with allergies, eczema and asthma who are big time grain lovers. I also suffer with hormonal imbalances and too many other things to mention. We are ready to make the switch and say goodbye to grains! I need all the help I can get! I would like this cook book for my son who is a very picky GF eater and loves dinosaurs. Would love this book for some new fun allergy friendly recipes and it looks fun! I’m absolutely fascinated by the Paleo diet and would love to get my hands on this cookbook so I could learn more about it. I like PP ON FB. Just liked Cook It Allergy Free! I need this cookbook because drastically changing my diet has enabled me to regain my health. I see some of the health issues I had in my children, thankfully on a much milder scale, and need some kid approved recipes to help heal them without them knowing! My family will soon be going Paleo (after by oldest son’s EGD s/p celiac dx) and this book will hopefully pave the way for our family to healthful, safe eating. I would love this book to help my daycare children learn to like more healthful food. One child in particular could GREATLY benefit from a change in what she eats. I followed your Facebook page. I was just diagnosed with narcolepsy and have decided to try Paleo to see if it makes me feel any better, I feel bad letting my kids eat all these horrible things just because I do not know how to incorporate Paleo in my children’s life, so I am determined to make it work for them too! I am trying very hard to make healthy/allergy free choices for my family. Any resources I can get would be more than helpful. My children and husband are all about mommies new diet, but so far they only like sweet potato fries. I am already a follower of paleo parents and cooking allergy free. I’d love this book because No 1 son thinks he’s a spinosaurus & No 2 son is allergic to dairy and soya. I also like COOK IT ALLERGY FREE on FB. I really want to make the switch over to Paleo and need a guide book to get me going. would love to get this book for our sister for our daughter who now eats gluten free! I now follow Paleo Parents on Facebook. I am also now following cook it allergy free. I would love this book to become a child again, rejuvenate my meals, and to share with my future grandkids! I have been research Gluten Free diet. however, It is not strict enough. Someone has suggested to try the Paleo diet. This book would be great help. I followed Cook It Allergy Free on FB. I followed Paleo Parents on FB. I follow Paleo Parents on Facebook! I want this book so that I can get some new ideas for helping my stomach/gut! We’re always trying to find yummy recipes that are allergy friendly! I like your fb page. I liked Paleo Parents. Thanks! I’m following you on Facebook as “Those Who Help Themselves” (I seldom use my personal Facebook account, so I wanted to stay updated :). I’m following Paleo Parents on Facebook as “Those Who Help Themselves” too. I DESPERATELY want this book because my son has allergies to a lot of different foods (corn, garlic, peanuts, oats and coconut and also has contact and environmental allergies on top of it), I’m gluten free and my daughter is in for food allergy testing next week and if nothing pops up she’s getting tested for Celiac. So, yeah, I can always use inspiration! I would like the book because we are just beginning our Gluten Free/Casein Free journey for my daughter and I’ve heard wonderful things about this book! I follow u on Facebook. I want this cookbook to help my kids better understand why we eat gluten, dairy, & sugar free. I also would like them to help me more in the kithchen & get excited about food & cooking. We’ve been gluten free for 4 years & are ready for some new recipes! I would love this book because I have been following a paleo diet and have seen tremendous digestive benefits! Followed Paleo Parents on Facebook! Followed Cook It Allergy Free on Facebook! I want this book because this is the way I love to feed my children. They are gluten free, so it makes sense to go Paleo, and we limit sugar in our house too. (As in honey, maple syrup, agave only…) My girls love to cook and it would be such a welcome addition to our lives! and also like paleo parents. Thanks!! I want to win for my child with the long list of allergies. Pick me! Pick me! I follow you on facebook and I feature your blog in the sidebar of blogs I follow on my own blog. And now I like Paelo Parents on facebook! Thank you for the suggestion! I need some more recipes for the way I eat and this book would be perfect. I want this book for my dairy, soy, egg intolerant little boy who should probably not be eating so much grains and sugar. I’m following Paleo Parents on facebook. I’m following Cook It Allergy Free on facebook. I follow you on FB already! I want to use the book to teach my son how to cook for himself even though he has lots of food allergies. I now follow Paelo Parents too! I need this book so I can convince my daughter to cook Paleo for her kids. They already ask me “what will this food do for us grandma?!”. If it makes them run fast they eat it. If it makes them run slow they won’t. They’re 3 and 4 so you get the picture. My daughter has food allergies so always looking for new recipes! Follow Paleo parents on facebook. I follow you on face book. Would love to own the book for my two grandchildren who are affected by Autism. This would be a great way to help with their counseling and explaining their diet to freinds and family. Thanks for reading this and helping out the kids to understand the wonders of their diets! I’m a g/f and learning paleo grandma, who wants to cook appealing, healthy things for (and with) my grandkids — this book would really help me out — we’d all be able to enjoy the finished results! I follow Paleo Parents. LOVE IT! My son would love this book. I see so many recipes that I would love to try with him. He seems to be so much happier with this lifestyle. We’re gluten free and dairy free at my house (with an almost 2 year old), so this cookbook would be awesome for our kitchen! I’d love to win this to use with my children, especially my oldest who has multiple food allergies & intolerances…thanks! I want this book to help prevent the progression of the autoimmune disease I was diagnosed with, and help to stop it from ever tormenting my kids the way it did/does me! I’m cutting all processed foods out of our diet, plus my kids have food allergies. This book sounds like it would be a good fit for where I want to take us. I want this book to help my 6 year old daughter’s class understand how she eats and why her food is sometimes “different”. I really want to get this book to empower my daughter and have some fun recipes to share with my kids that they like and could help with. We were already basically eating paleo when I learned about the diet! But I love that it’s geared towards kids and getting them in the kitchen. My 9 year old would flip – she adores dinosaurs and loves helping in the kitchen. I already follow you on Facebook. We have to be gluten free due to my celiac and passing it on to my kiddos. As well they have had problems w/ dairy. This has made things difficult to say the least esp. dealing w/ a picky 3 yr. old 🙁 I have tried a couple recipes from the website and they have been a huge success. This book would really help me help my son embrace healthier food choices, learn about food choices, and help when little sister becomes faced w/ the same challanges.